Why does Christmas turn me into an adrenaline-filled mommy monster? Christmas is the most wonderful time of the year – and I am here for it all! During this season, I should be quietly reflecting on the beauty of the Savior coming to Earth to save us all. But, nothing, I mean, nothing is quiet around here. And, don’t hate me, but it is not because of all the Christmas “stuff.” My home was decorated the Sunday after Thanksgiving. It currently looks like Christmas threw up, which is just the way I like it. Our mismatched décor brings me great joy. My shopping is 95% done. Seriously. All I should be doing at this point is drinking eggnog, eating cookies, singing carols, wrapping presents, and celebrating. But, what am I doing? I am acting insane and using Christmas as an excuse. Let me give you some examples that have landed me on Santa’s naughty list. 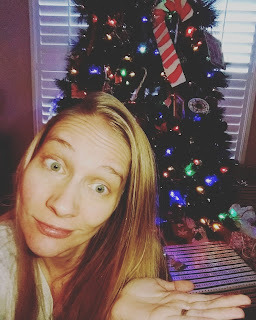 First, I had a teensy holiday stress meltdown over Thanksgiving one night after the kids went to bed regarding cleaning the house in order to pull out the Christmas decorations and prepare for hosting. I lost my chill – totally. I basically said (yelled) every awful thing possible and set a record for the number of cuss words to pass through my lips in a given amount of time. Only to stop suddenly when I heard a pair of tiny feet walking around upstairs. My sensitive child had been awake and overheard every nasty word of his mother’s diatribe. I tried to rectify my mistake by calling him downstairs and apologizing and letting him know immediately that mommy was wrong and shouldn’t have said all those things. My 6-year-old son then gently told me, “Be careful, Mommy. That is deadly poison. Your words are more hurtful than any weapon.” And, then, I cried because my 6-year-old just preached the truth to his adult mom who lost her chill about not having a clean house. Next, I yelled at my kids to “STAY OUT OF THE HOUSE!” as I was trying to rush and put some stinkin’ candy in the calendar from our invisible elf. We don’t do the whole Elf on the Shelf because I recognize when something is beyond my limitations. However, our “invisible elf” does leave a piece of candy in the advent calendar. All my husband and I have to do is put a piece of candy in the calendar…and we still forget! And, to make matters worse, yesterday as I was rushing to get into the house, I thought my husband had the kids outside when I was almost caught in the act. Hence, the scary yelling to “STAY OUT OF THE HOUSE! TAKE THE DOG POTTY RIGHT NOW!” and tears from my confused children because their mother was not letting them in their own house. Finally, the first words I said to my kids this morning were “STOP THAT CHRISTMAS MERRIMAS AND TAKE YOUR BUTTS DOWNSTAIRS! IT IS TOO EARLY FOR ALL THAT!” because they were caroling at 7:00 AM. I really liked your blog post. Especially, where you said “If you are feeling lonely or lost, I encourage you to open the doors to your home and put out some extra seats at the table”. Its Golden rule to role the world.